Motorcycle riding is something that feels great when you do it by yourself, but it feels better when you do it with a group. Finding a group of like-minded people who love to ride means you'll always have company on your rides. If you are new to an area and are looking to meet up with a group or riders, check out the local bike shops. They should be able to tell you who to contact to join a group. Look for a group that suits your interests. Many groups are all men who like to do camping weekends. If that's not your thing, ask around for what is. If you a woman and you want to ride with the ladies, ask around until you find a group that suits your needs. Once you find a group to ride with, you'll need to take some things into consideration as you begin your group riding experience. You'll need to talk through with your riding group the sorts of rides they are interested in taking. Hopefully, you'll find a group of people who share your interest, whether it's driving down scenic highways or following back roads wherever they lead. Establish some signals with the riders in your group. Get at least the basics down. You'll need a signal for when someone needs to stop for gas. Another important symbol will be that you need to stop. Perhaps another is a sign for when someone is hungry or thirsty. Be sure that everyone in the group understands these symbols before you head out. It's always good to set a meeting place in case someone gets cut off from the group, and to exchange cell phone numbers, just in case. When you are riding, there are some things to keep in mind so that you are riding safely as a group. When you get your group together, think in multiples of five. Five bikes riding together can be pretty safe. If you get more than that, it can get confusing and people can get frustrated. If you have more than five, break the big group down into smaller groups. Try to match up riding styles, with the faster people together and the more cautious people together. That makes for a more fun ride. When you're riding with a group, ride in a staggered formation. The first bike should be on the right side of the lane, the second bike on the left, and so forth. Don't ride side by side, and keep at least a two second riding distance between you and the bike in front of you. The only time you will want to be side by side with another bike is when you're stopped at a light or a stop sign. Then it's a good idea to take over the whole lane. If you need to pass a car ahead of you or another bike, do this solo. Do not pass anyone or anything in pairs. 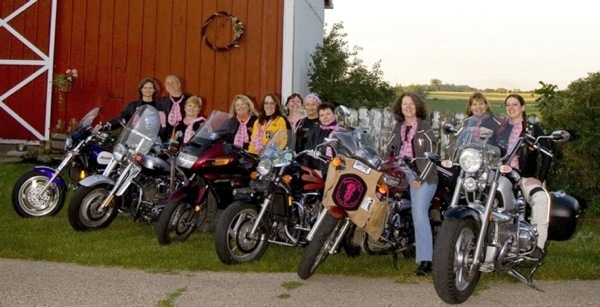 Riding with a group can really make a trip a fun event. Spend some time with your group and decide on a great destination and maybe even some stops along the way. Understand that everyone in the group can have different preferences, but that trying new things can sometimes surprise you. Agreeing to a trip you know you're going to hate is not a good idea, but maybe saying yes to a stop along the way will surprise you. Enjoy the rides and make some good friends. It doesn't get much better than this.